American singer/songwriter/guitarist Merrell Fankhauser was known as one of the innovators of surf guitar and found his way into the sixties psychedelic folk-rock movement. His biggest hit was as a member of The Impacts, performing the surf guitar instrumental "Wipeout." Drummer Ed Cassidy had a 30 year career as a member of the rock band Spirit. They broke-through in the late-sixties with a string of albums that crack the "top 100" on the album charts and found commercial success with the hit single "I Got A Line On You." The band motored on until the death of founding member Randy California in 1997. Then fate stepped in and teamed Merrell Fankhauser with Ed Cassidy to create the Fankhauser Cassidy Band which would bring classic rock of the sixties and seventies back to life. The band would perform for together for almost fifteen years until Cassidy died of cancer in 2012. To honor his memory and to put together many of these great recordings into one place, Gonzo Multimedia recently released the new album "On The Blue Road." 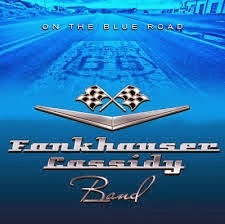 This double-CD includes some of the best original and cover recordings done by the Fanhauser Cassidy Band. Disc one is made up mainly of cover songs including some blues standards like the "32/20 Blues" and "Louisiana Blues." They put new life into old classics like "Walking The Dog" and "High Heel Sneakers," before showcasing some originals like the acoustic, heartfelt outpouring of "Nicky's Song" and the country-flavored recap of "Psychedelic Dreams." The second disc continues with the blues on the Fankhauser original "Hot Night In Louisville" and the country sway of the instrumental "Goin' Back To Delta." The band really heats up with Fankhauser's son taking over the lead vocals on the rocking "Cosmic Lady," before Ed Cassidy takes the spotlight on the masterful drum solo of "Cassidy's Big Beat." The set closes with the mellow acoustics of "Papa Told Me." Also included is a three-minute interview with drummer Ed Cassidy. To find out more about this outstanding compilation, please visit www.gonzomultimedia.co.uk/product_details/15609.